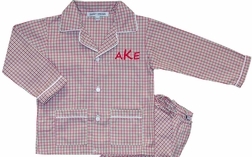 We just love these adorable Christmas gingham pajamas for little boys by Sweet Dreams! They are made from gingham in red, green and white. The sleeves, collar, legs and front pockets are piped in white. If you choose a monogram, it is put on the front left breast pocket area. Perfect for Christmas cards, Christmas Eve and Christmas morning. Santa will love them!